This is our custom-built Specialty "Stereo Y" cable with Gold Stereo 1/8" (3.5 mm, Mini) Male to connectors of your selection. 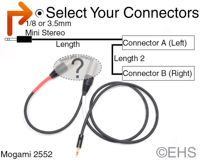 Construction is Mogami 2552 cable, all Neutrik connectors, Stereo TRS 1/8" Male "Y" to your selection of connectors (one Left, one Right), lengths and options. Neutrik connectors are some of the best connectors around. Mogami 2552 cable is very flexible, durable, light-weight cable (Y-cables only available in Mogami 2552 and 2319). This cable could be used to connect things like iPods, MP3 players, and phones to a mixer. Due to the thickness of the 2552 cable and that we do not use molded connectors, the configuration of this cable is not like standard consumer cables. Our cable has the Gold Stereo (TRS) 1/8" on end A (select "Length" for cable length) to the left channel connector "Connector A" (labeled with white) that then "Y's" out to the Right channel connector "Connector B" (labeled with Red). "Length 2" defines the length between the left and right connectors.